Foucault’s approach to the archaeological study of discourse, particularly the “tree of enunciative derivation,” described in his text The Archaeology of Knowledge, is a very useful concept for exploring the way in which networked organizations develop and how each node in the organizational network functions within the larger frame of the network. To explore the way in which Foucault’s theory can be applied to a large networked organization, I have chosen to examine La Leche League, an international organization dedicated to supporting breastfeeding mothers and to promoting understanding of breastfeeding. La Leche League was officially formed in 1958 by a group of nursing mothers in Illinois, and has now grown to an international organization of “mother-to-mother” breastfeeding support and advocacy groups. The organization has a board of directors, an Executive Director, and an Associate Director. Countries with a La Leche League presence have their own national chapters of La Leche League. (The US umbrella organization is called La Leche League USA.) The USA organization is further broken down into state or regional groups. These groups are further divided into either individual meeting groups (in cities with one La Leche League group), or in large cities they may be divided into a city-wide group that is further divided into several individual groups. At the local level, La Leche League meetings are headed by a certified La Leche League Group Leader. While the primary goal of La Leche League is to provide support for breastfeeding mothers and advocate for breastfeeding in the local La Leche League meetings, the organization also has other ways of meeting these goals, such as the Peer Counseling program where non-certified La Leche League members counsel others who are nursing. The organization also hosts conferences and other educationally focused meetings. 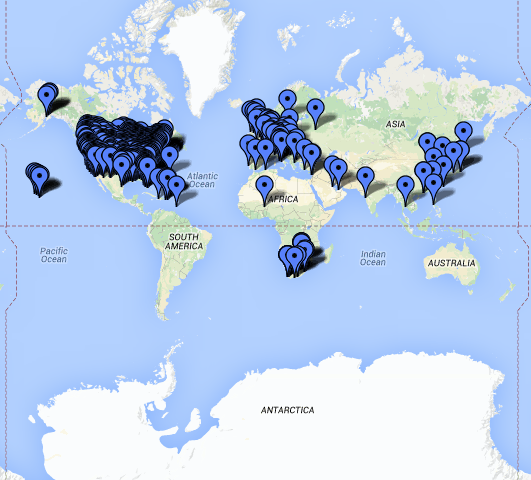 Map of International La Leche League Groups. If we were to view the organization as a network, the central node in the group would be the central organization, which has a “core philosophy” composed of 10 separate statements. Other nodes (listed in order of their distance from the central node) include national umbrella groups, regional groups, individual groups, the group leaders, and individual group members. Foucault’s concept of the “tree of enunciative derivation” includes statements at all levels. According to Foucault, the statement has no criteria for unity, and it is not a unit; instead, it is a “function that cuts across a domain of structures and possible unities and reveals them with concrete contents, in time and space” (87). 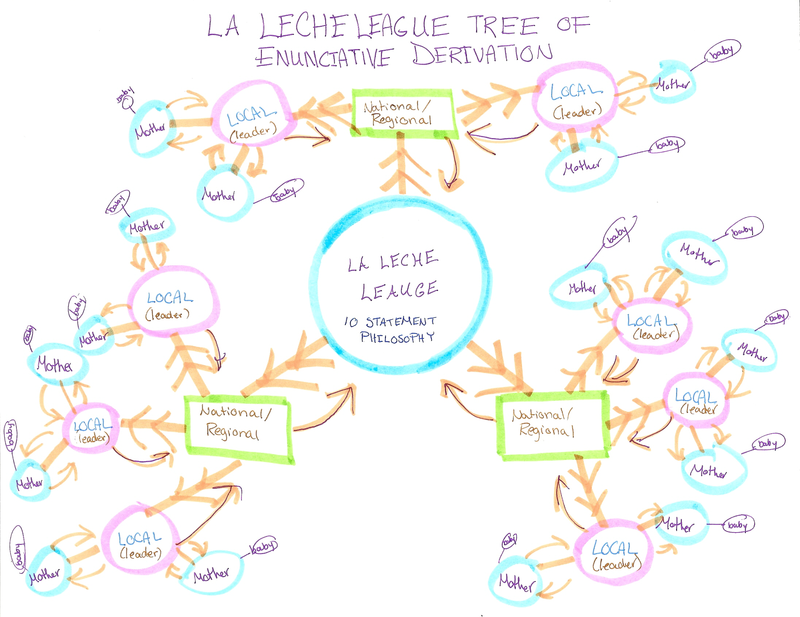 By looking at the dispersion of statements through the network of La Leche League, I hope to uncover evidence about the way in which statements that seem abstract at the base level of the tree of enunciative derivation are put into action and revealed in the “concrete contents” and “time and space” (87) of the local Le Leche League meeting. • Mothering through breastfeeding is the most natural and effective way of understanding and satisfying the needs of the baby. • Mother and baby need to be together early and often to establish a satisfying relationship and an adequate milk supply. • In the early years the baby has an intense need to be with his mother which is as basic as his need for food. • Breast milk is the superior infant food. • For the healthy, full-term baby, breast milk is the only food necessary until the baby shows signs of needing solids, about the middle of the first year after birth. • Ideally the breastfeeding relationship will continue until the baby outgrows the need. • Alert and active participation by the mother in childbirth is a help in getting breastfeeding off to a good start. • Breastfeeding is enhanced and the nursing couple sustained by the loving support, help, and companionship of the baby’s father. A father’s unique relationship with his baby is an important element in the child’s development from early infancy. • Good nutrition means eating a well-balanced and varied diet of foods in as close to their natural state as possible. The central node of the organization, the base of the tree of enunciative formation, is a guiding philosophy, but until these statements are acted upon by the node branching from the central node, they remain merely untested, undescribed statements. La Leche League’s philosophy , as the root of the network, are the governing statements “that concern the definition of observable structures and the field of possible objects, those that prescribe the forms of description and the perceptual codes that it can use, those that reveal the most general possibilities of characterization, and thus open up a whole domain of concepts to be structures, and those that, while constituting a strategic choice, leave room for the greatest number of subsequent options” (147). La Leche League may have broad rules guiding the general workings of a meeting, and group leaders may be expected to behave in certain ways, share certain types of materials, and provide certain types of support to nursing mothers, but the central organization is not directly involved in these acts. It seems then, that agency is most strongly associated with the nursing mother. The mother and her child are the subjects of most of the statements guiding the organization. Foucault says that “the subject of the statement is also the subject of the operation” and that a proposition can be called a statement if “the position of the subject can be assigned” (95). While other nodes in the network have some agency (such as in the case of the group leader, who can report back to the organization, which may in turn act on the leader’s information), the primary agency belongs to the mother. It is the activity of the mother, along with her child, that is the subject, and it is only the mother who can see that the true goals of the organization are meet (or at least attempted to be met). It is in the individual meetings, often several nodes removed from the originating node of the central administration of the organization, that the true significance of the governing statements is made evident. It is here that nursing mothers come, looking for real answers to real problems with nursing. Here, at the local meeting, the interaction between network nodes is much more specific. The nursing mother, the far summit of the network, comes to the group leader seeking information. The group leader shares information based on the basic philosophies of the organization, but much more specific in nature (such as proper latch techniques and information about using a SNS (supplemental nursing system). The mother may report back that the techniques have not worked for her, and the group leader may suggest alternative solutions. This specificity of the local meeting reflects what Foucault says about the far reaching branches of the tree of enunciative derivation. He says, “at the end of the branches, or at various places in the whole, a burgeoning of ‘discoveries’ (like that of fossil series), conceptual transformations (like the new definition of the genus), the emergence of new notions (like that of mammals or organisms, technical improvements (principles for organizing collections, methods of classification, and nomenclature)” (147). It is at the local group level that the need for new interpretations or articulations of statements is made evident. The necessity for specific transformations or understandings of core statements becomes evident, and the group leaders may report these transformations back to the central organization, which may then develop a new statement giving suggestions for how group leaders may want to address specific issues that could possibly arise. This seems to have been the case when, in 1987, La Leche League published an article called “Guidelines for Helping Employed Mothers Breastfeed” in Leaven, La Leche League’s quarterly journal. Accoding to a note on the website, “These guidelines for holding a special meeting for employed breastfeeding women are the culmination of a 1986 Pilot Study conducted in Colorado and Wyoming. It was developed by Alice Edwards, Regional Administrator of the Mountain Region” (La Leche League). It seems that the need for strategies to helping employed mothers was noticed at the local level, and a regional administrator attempted to pilot specific strategies to do so, then reported back to the organization, which disseminated the information for other group leaders. Map of La Leche League Network. The orginzation serves as the base and includes 10 key statements of philosophy, which guide activities at other levels. Each level further from the base interprets the statements with increasing specificity. The nodes at the summit report back and inform the future of the organization. While at the organizational level, there is a network of leadership, the base of the organization is the statements that guide the organization. It seems likely that, if the organization were to transform, it would do so at the local level first before it does at the organizational level because it seems to be at the local level hat “the appearances of objects, types of enunciation, concepts, strategic choices, (or transformations that affect those that already exist)” occur at the local (or regional levels)—the branching from the tree. Foucault says that archaeology shows that events (like individual meetings or conversations between group leaders and mothers may transform statements by being presented, becoming an object for discourse, being recorded, “described, explained, elaborated into concepts, and provide the opportunity for a theoretical choice” (167). So what happens at the summit may inform the base organization. This is why I believe that if the network dissolves, it will do so first at the local level. The unique moments of the network may pass away, and groups may stop meeting. Eventually, if the meetings are discontinued, then what remains? I suppose it would be the base of the tree of enunciative derivation, those statements that guide the organization, as well as new statements that have been introduced into the discourse through the activity of the organization. Foucault’s tree of enunciative derivation was very useful for examining the network of La Leche League, but one thing that I think that I would like to explore further that I do not see a way into with Foucault’s theory is genre theory’s focus on action and the way in which action is guided by meaning, by perception, and not by material (Miller 156). I also would be very interested in exploring Bazerman’s claim about the three levels of analysis of a speech act: the literal statement, the intended act, the actual effect (Bazerman 315). Foucault, Michel, Alan Sheridan, and Michel Foucault. The Archaeology of Knowledge. New York: Pantheon Books, 1972. Print. “LLLI Philosophy.” La Leche League. N. p., n.d. Web. 18 Feb. 2014.